As a devoted home canner, I sometimes get swept up in the idea that the more I do or add to a batch of preserves, the better. Recently though, I was reminded that the simple approach is often the most delicious (and it’s always the easiest, to boot). Over the course of a recent week, I found myself the recipient of nearly 12 pounds of apples and pears. The apples were leftover from a friend’s CSA share pick-up and the pears were a gift from a lovely couple that took a class with me. I spent a couple of days enjoying seeing the bounty of autumn fruit on my dining room table before determining that it was time to preserve. I contemplated a number of different recipes before deciding that at least half of the fruit was destined for a batch of sauce. Still, I thought that I was going to make a complex, highly spiced sauce. 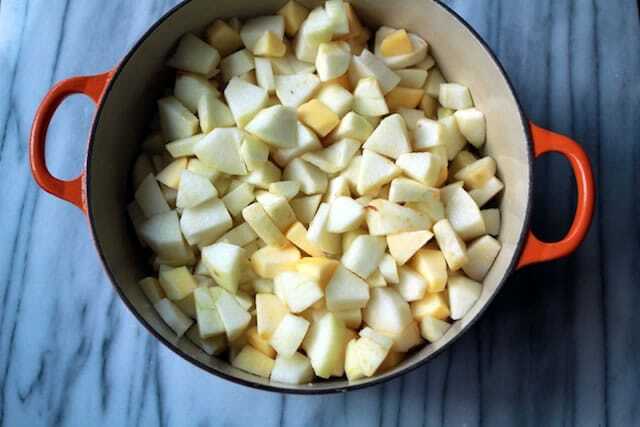 I peeled, cored, and diced half of the apples and pears, and heaped them into a Dutch oven with the juice from one orange and two lemons. I added an additional drizzle of water to ensure that they wouldn’t stick to the bottom of the pot. I put a lid on the pot and turned the heat to medium low. I let the fruit soften for the better part of an hour, stirring occasionally when the thought occurred. Then, because the hour was quite late when the sauce was nicely textured, I simply put the lid on and slid the pan off the burner, promising myself that I would add spices and sweeteners in the morning. Only, the next morning, when I went to taste the sauce, I realized that it didn’t need a single thing. 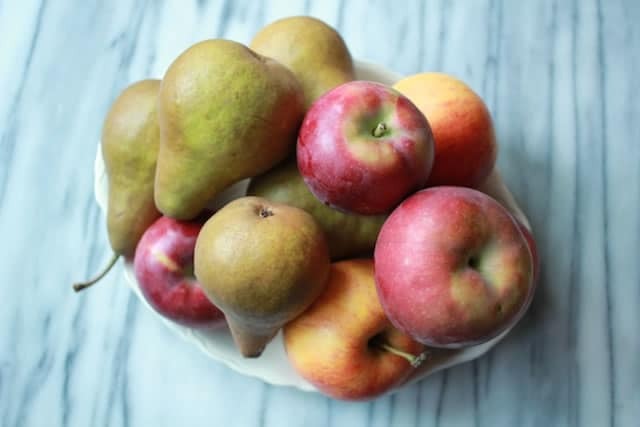 The apples gave it plenty of sweetness, while the pears added a pleasantly grainy texture. The small amount of orange and lemon juice I’d included offered the necessary tang. It was perfect just as it was. I brought the sauce back up to a boil and canned it in pint jars (city living means that I have a comically small refrigerator. Unless something is destined to be eaten in the immediate future, I try to make it shelf stable). Simple, delicious, and only processed in my kitchen and by my own hands. Just the thing for October Unprocessed! The apples gave it plenty of sweetness, while the pears added a pleasantly grainy texture. Peel, core, and diced the apples and pears. Place them in a large, heavy-bottomed pot. Add the orange juice, lemon juice, and water. Set the pot on the stove over medium-low heat. Cook, stirring occasionally, for about an hour, or until you can mash the fruit with the back of a spoon. When the sauce is done, use a potato masher to break up any remaining pieces. If you prefer a smoother texture, use an immersion blender to puree the sauce. 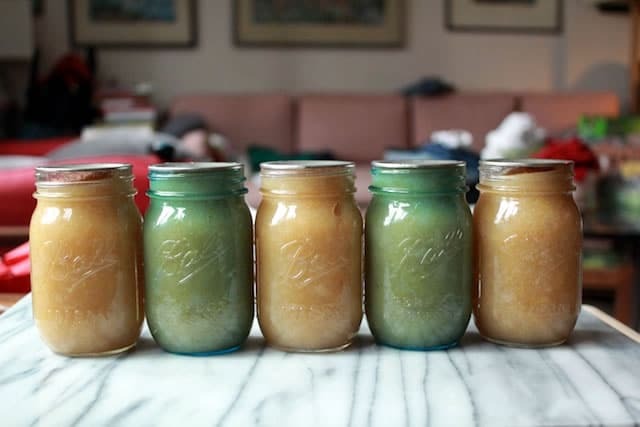 Prepare a boiling water bath canner and five pint jars. 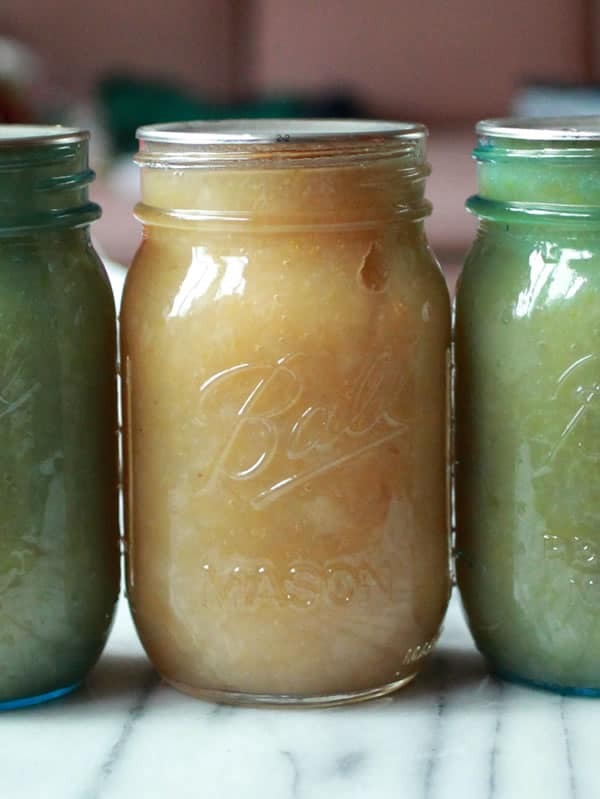 Funnel apple pear sauce into the prepared jars. Wipe rims, apply lids and rings and process in a boiling water bath canner for 15 minutes (if you live above 1,000 feet in elevation, adjust your processing time accordingly). When time is up, slide canning pot off the heat and remove the lid. Let the jars cool slowly in the pot for ten minutes. When the cooling time is up, remove the jars from the canner and place them on a folded kitchen towel to cool. When the jars are cool enough to handle, remove the rings and test the seals. Sealed jars can be stored in a cool, dark place for up to a year. Unsealed jars should be refrigerated and eaten within two weeks. Just what I needed! I’m a big fan of your books and recipes, and I will definitely try this one. I like simple! I picked pears two weeks ago and set them in my basement. Today I went through and moved them to my fridge because they were getting soft. 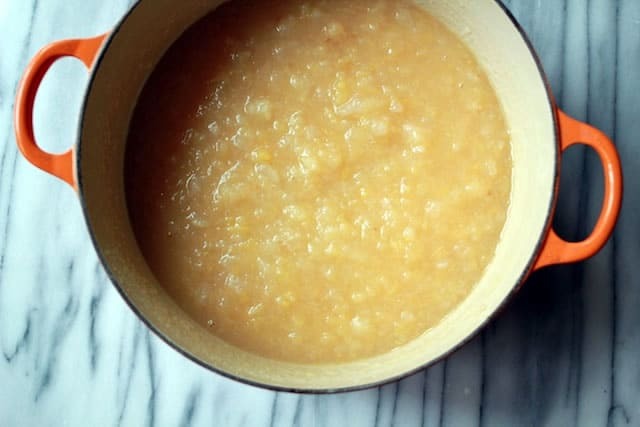 I am a procrastinator by nature and that usually means I want to do something else like go apple picking and make applesauce instead of deal with the pears. If I do go apple picking today instead of processing the pears, then I could make this sauce. It would kill two birds with one stone. An apple-pear sauce would be a nice addition to my already full shelf of applesauces. I just made this. Very delicious. I only got three pints. Will double next time for a full pressure cooker. Thanks for sharing the recipe! I have no idea what kind of apples I used. They were extras from a friend.